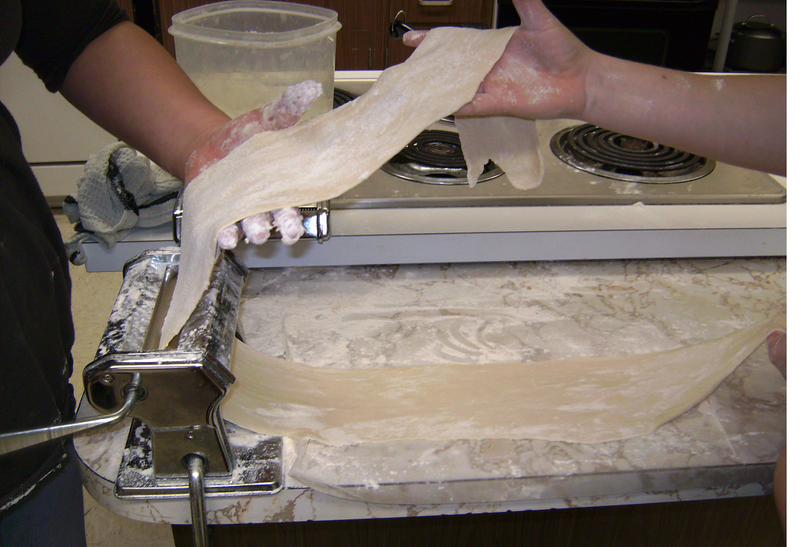 Students will create their own pasta dough and cut it into noodles. Demonstration table set up and ready with chairs awaiting eager students. The first year I did this lab I didn’t have pasta drying racks so I made make-shift ones out of cooling racks and large pots and paper towel rolls. If you have the money purchase the drying racks they are so much easier to deal with. Be sure to put the pasta in bags as soon as it dries or else it starts falling and when it hits the table it breaks into pieces and gets all over the place! Demonstrate how to make pasta from scratch or show this video demonstration on how its done on a projector. Give a brief overview of the origin of pasta and its history. Students will prepare pasta as demonstrated.